You may be looking forward to an upcoming DIY project with paint to decorate the entire household. In many cases, you may have already patched and primed the area that you want to enhance with a bold, new color. Don’t grab that paint can yet, however. There’s an important step that must be completed before you roll or brush that color on. Taping the edges is critical to a successful paint job. You’ll have clean lines with no frustrating color bleeding into crown moldings or floors. Store the masking tape away, and pull out some painter’s tape. This specialized product is meant to be applied and pulled off without harming your wall. Get to know some of the best products in the marketplace today, and your paint job will look like a professional was at work. The most tedious part of any paint job is the preparation. From cleaning the walls to lining them with tape, the actual painting portion seems to take no time at all. Prep your walls for a perfect paint project with Duck Brand’s product. 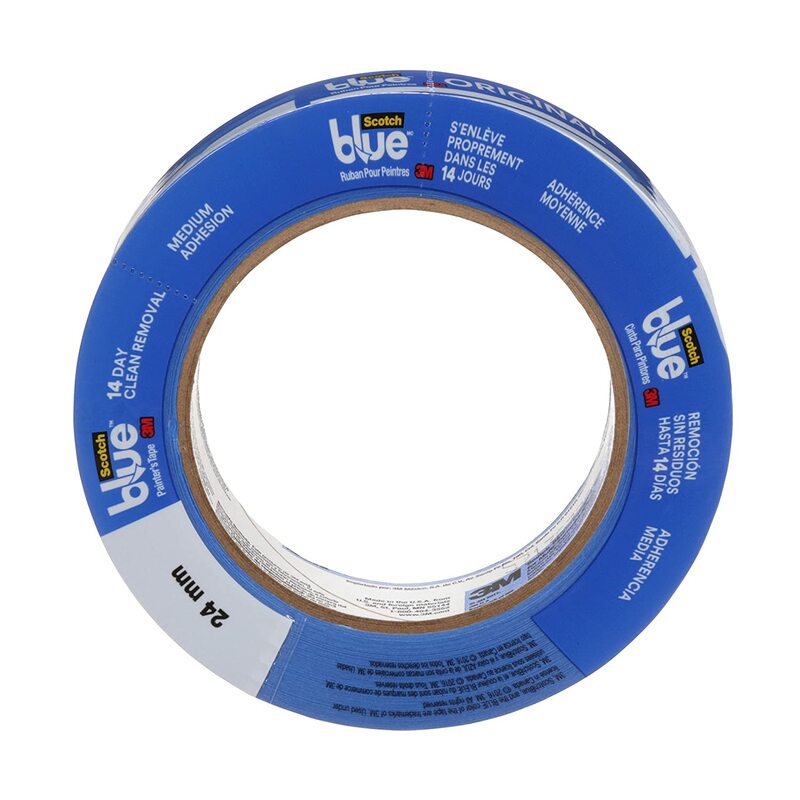 This painter’s tape comes as a large, blue roll that you can see in almost any light level. There’s a mixture of different reviews for this item, but you can try it yourself in order to make that ultimate purchasing decision. Leave this product on any recommended surface, and it will peel off with no problems. 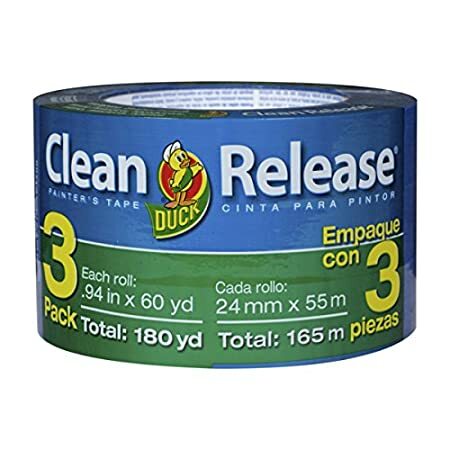 Duck Brand advertises this product with a “clean release” mechanism. You won’t see or feel any residues on the surfaces that you just uncovered. Simply apply and pull the tape within a 14-day time period. Leaving the product on the surface for a longer time period will only damage the area. You aren’t limited to one roll when you buy this item. In fact, buy it in bulk sizes. Try three-, six- or 24-packs of this painter’s tape. It’s always a good idea to have more materials than you think you’ll need for a project. Try a three-pack of tape to begin your work. Save any unused tape for other projects. It comes in handy for future work inside or outside of the home. Be aware that there are multiple complaints about this product having a poor-adhesion record. Users report that the tape barely remains on the wall after only a few minutes. Take a look at the surface that you’re working on. This product may not be compatible with that material. Metal, wood, wallpaper and other materials are perfectly suited for this brand. Try the Duck Brand out before you make any claims about the item. This manufacturer is proud of every product that they sell. This item has a nearly one-inch wide design for the 60 yards of material that you’ll receive in one roll. One inch may seem too large for your painting needs, but it’s actually a strategic dimension. With the tape in place, you will roll or brush on paint around it. If you happen to paint some of the tape, the one-inch width will usually catch most of your mistake. When you peel off the tape, the paint overlap is quickly removed. Your wall or ceiling suddenly has a clean effect. Use this tape on other projects around the home too. Some consumers appreciate its application on canvas as they create art. You can also apply it to tile when you work on a paint job in the kitchen. Your tape should stick without any issues if you apply it in the right manner. Start your tape by pressing the edge against the wall by using several fingers. Continue to roll the product out as you keep those fingers pressed firmly against the surface. The adhesive will properly stick with this strategy. At the end of the day, you can have a wall with a line that’s ready for paint. No one will ever know that a professional didn’t perform the work. Another reliable product for all of your painting pleasures is the painter’s tape designed by 3M. With a 3-inch core diameter, you can fit this roll on your arm or hook it onto any fixture. The bright-blue color makes it perfect for visibility purposes across any wall surface too. When you think that you’ve found the perfect painter’s tape in another product, give this brand a try. It might surprise you with some quality features. The main feature advertised with this product is its Edge-Lock technology. Once you press the tape onto the wall, these edges will remain locked against the surface so that you can move a brush or roller over them. No bleed-through should occur, which will otherwise create wavy lines against the wall. For this feature alone, many consumers flock to 3M’s products. While the manufacturer touts the edge-detail benefits of their product, consumers are reporting that the overall adhesion isn’t as strong as they’d prefer. 3M clearly indicates that this item comes with medium adhesion. This designation means that the tape can be pressed against a wall for a short time period and release with ease afterward. Consumers report that the adhesion design allows the tape to peel or pop up after only a few minutes, however. This issue may be user error, but you might try the product yourself before making a final determination. The core has a large diameter so you might wonder if the tape length is lacking. However, you’ll receive a full, 180-feet of sticky tape with just one roll. This length can easily service an entire wall. For most projects, you’ll need to use multiple rolls in order to cover all of the necessary surfaces. Overlap any tape edges, and continue with your work. 3M has been in business for several decades so they understand the contracting business. You’ll always want several rolls on hand during any major paint job. The manufacturer knows that you’ll use this tape on several different surfaces. They want to make the entire prepping process as simple as possible so that you only apply one tape product. This item is advertised as being useful on metal, trim, baseboards and glass. Some consumers report that it works spectacularly on wood surfaces too. If you apply it to textured drywall, however, you may not see the perfect results that you’re looking for in a painter’s tape. Bleed-through issues have been reported on drywall. Try to keep this tape on the materials that it’s designed for, and you should see professional results in no time. Apply this product with your hands and refine it with a small tool if necessary. Rolls are made out of tough materials that can hold up under some abuse. Always remove it after 14 days, however, because it does have an operational lifespan. You’ll be left with clean lines that have no cracked or chipped sections. 3M strives to please every DIY enthusiast with the best products. 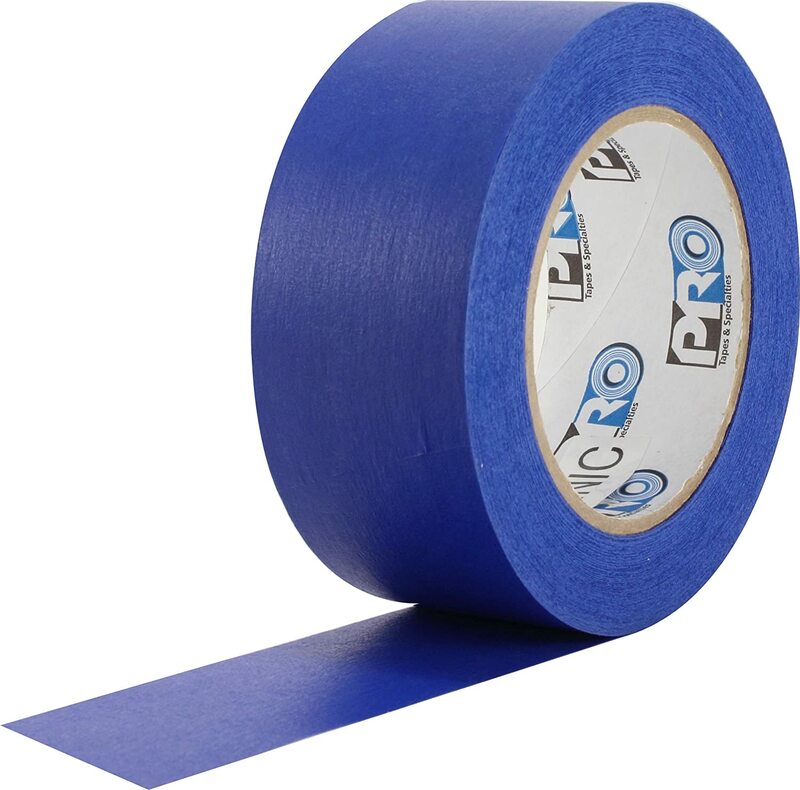 Work like a professional with this Pro Scenic product by Pro Tapes on your hip. It has a rubberized component that gives it some versatility as you stretch it either indoors or outdoors. With its bright-blue hue, you’ll always know when to start your next paint roll against the wall. Although this brand has a slightly higher price point than other tapes, it’s worth your time to try it out during your next project. You might reduce your prep time as a result of this high-quality item. Many tape products limit you to only a few different surfaces, such as drywall or plaster. Pro Tapes understands that consumers have a mixture of different materials in their homes. In fact, this tape can adhere to nearly any coated surface. Polyurethane, lacquer and other sealants aren’t a problem for this item. Press it against wallpaper too. It won’t tear at the materials, which can create an entirely new project as a result. Add Pro Scenic to your unfinished wood, and there won’t be any ill effects against the surface. A paint job that you thought would take one weekend can stretch into next week. Don’t worry about your prepped area, however, because this tape will stand the test of time. It will last for 14 days on your walls without leaving any residues. If you aren’t sure when you’ll return to the project, however, it’s a smart idea to remove the tape. Don’t risk any residues marring your walls if a project will end up lasting a month or longer. If you live in a humid area, this tape won’t even flinch at the change in moisture levels. It resists humidity’s effects as the synthetic rubber allows it to move in minute ways during the day and night. Cracks and bubbles won’t form even if the humidity is particularly dense. Along with moisture control is UV resistance. Ultraviolet radiation from the sun will quickly harm most tapes when they’re applied outside. Pro Tapes added UV sealant to their product with a high-temperature resistance. Extreme heat won’t hinder your project’s timeline because the tape will remain in place. It will still have a 14-day lifespan, however, so continue to work during both the cold and heat. You aren’t limited to just lining your walls and ceilings with this product. In fact, some consumers have used it in more unusual situations. Babyproofing hotels by covering table corners with this tape is one of the more unique ideas that keep these rolls flying off of the shelves. Compare this product to your previous tape purchases, and it might win out in the end. When you find a painter’s tape that you can trust, you can complete nearly any project with confidence. You might have a simple paint job that you’re trying to complete. In fact, the area might be as small as one accent wall. 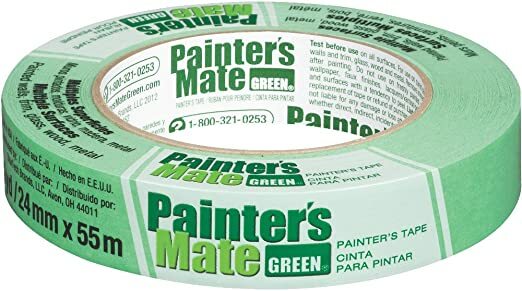 When you just need a few basic supplies, think of the 8-Day product by Painter’s Mate Green. You’ll notice this tape’s difference by its appearance. It has a bright-green hue, which is in great contrast to the blue products usually saturating the marketplace. As a budget pick, try this brand for your next paint job. This tape is extremely inexpensive at under $3 per roll. You can purchase several rolls at this price, and you’ll still have enough money to buy that premium paint. Many consumers overlook this brand because of its price. Don’t miss out on a great product, however. Be aware that this tape doesn’t have a 14-day application window. It will remain residue-free if you pull it off within 8 days. For most small projects, this timeline is reasonable. You want to peel the tape away while the paint is wet anyway. Complete your paint job, and immediately peel the product off from the edges. Because the paint is wet, it won’t crack or bubble as the tape moves away from the area. The paint has a chance to adhere to the wall with a clean edge. This tape does have UV resistance built into its design. Don’t be afraid to use it outdoors during a sunny day. It will peel off without any problems. When you use this product according to its instructions, you’ll save money on both supplies and labor. That paint job will look perfect for years to come. Regardless of your experience with painting, you’ll probably need to adjust and correct the painter’s tape as you press it against a surface. Professionals will even need to adjust their lines at times. Select a product that has easy manageability. You want to be able to stretch and realign the tape without struggling with it. In most cases, you want it to loosely stick on the surface for a few minutes as you finish that line. It can be pressed down afterward when the area is perfectly aligned. When you have to struggle with a product, it will only create ripples and tears along your painting line. You may want a tape that’s easy to manage, but it must also have a consistent adherence to the wall. When you finalize the location for your tape, press it firmly against the wall, ceiling or floor. Quality products won’t rise, bubble or warp afterward. The tape should remain perfectly flat against the surface. If you notice that some edges are curling or lifting, the paint job will suffer as a result. Paint will act like water as it encounters these edges. After pulling the tape away, you’ll have uneven and unsightly edges. Try several tape brands before you buy multiple rolls. Use the power of observation to pick the right one for your textured walls and other locations. It may not seem like an important consideration, but the color of the tape is a critical feature. Blue, green and other bold colors are common for painter’s tape among several different brands. These colors provide a contrast with your walls. Because the majority of residential walls are light colors, the bold-tape hues allow you to see the dividing lines that much better. Low-light conditions won’t hinder your paint job because the line will be obvious from several feet away. The tape’s color also makes it easier for you to find the roll when you have a busy area full of paint cans, brushes and protective tarps. Although most DIY paint jobs are performed indoors, you may want to complete an outdoor project at some point. Ideally, look for a painter’s tape that has some UV or ultraviolet protection. Sunlight radiation will consistently break down outdoor items if they aren’t sealed or coated with specialized substances. If you prep an outdoor wall with tape meant for indoor use, it won’t adhere or pull away very well. The UV treatment will allow the product to work the same whether it’s indoors or outdoors. This UV coating is especially important if you’re planning on leaving the tape on for several days under the bright sun. Some consumers may tape their work area, but then they leave the project untouched for a few weeks. It’s important to remember that painter’s tape cannot be left on the wall indefinitely. Most products have a limitation of about 2 weeks. After being left on a wall for this long time period, the product may leave a residue or peel off in tiny sections. As a result, you’ll need to prepare the wall again by cleaning it with mineral spirits as you remove those residues. Leaving any tape brand on a surface for too long will always result in poor conditions across the surface. Follow each item’s instructions, and it should work without any issues. A beautiful paint job can be yours when you work just like the professionals.